I had just begun working with Rob, who is now one of my favorite instructors/training partners. 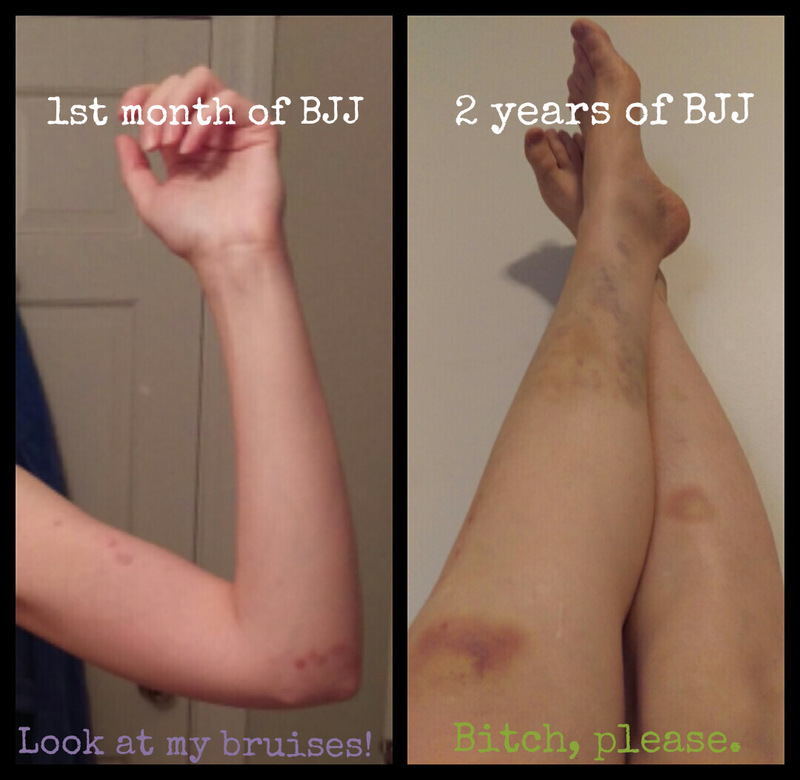 I cannot tell you the date, but I will never forget the class – a Wednesday No Gi night working techniques from knee to belly. Rob is shorter than me but a good bit denser. Every time he took knee to belly, I made faces and noises. I complained about how uncomfortable it was and how much I didn’t like it. After a while, Rob decided to make a point. He had me go knee to belly with my full weight on him. Then he reach up and pushed one knuckle into my sternum. I made a face and moved away. He asked me to examine the situation. He was able to hold my full weight without issue from a position where he couldn’t back away from the pressure. I felt the pressure of one knuckle and immediately tried to get away from it. The knuckle and the knee were both uncomfortable but neither was doing damage. They weren’t even going to leave a bruise. I absorbed that thought for a moment then asked him to push into me again, resisting the urge to move away. After the initial contact – almost like a “startle” reaction – the pressure was more annoying than painful and I pushed into it instead of backing away. Thus began my journey into understanding the difference between pain and injury. More recently, after a good hard training session, Rob commented the difference that he had seen. I went from punking out at the pressure of one knuckle to facing a line of “hopeless” submissions with grit and stubbornness. (And technically sound counter moves, but that’s another topic.) He started to fold my knee the wrong way, I fixed it and kept coming. He had to tell me about these things because, in the moment, it just felt like rolling as usual. I knew I was harder (more stubborn) to submit, but I didn’t realize how far I’d come. Another time, he had both of my sleeves and was pushing a knee into my chest hard. I honestly thought I was going to come away with a bruise. Instead of trying to get away from the pressure, I push into him while I was looking for a way out. I was going to be damned if I tapped to something that wasn’t a submission (aka pain compliance). I am a knuckle punk no longer.